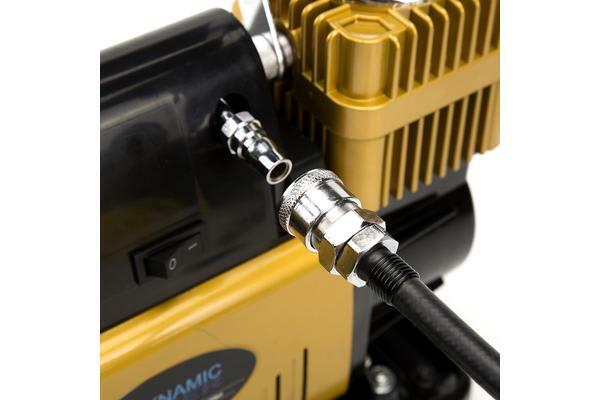 This Dynamic Power 12V 300L/M 220PSI Heavy Duty 50mm Cylinder Portable Air Compressor is a must have if you are an off-road enthusiast! The handiness and quality will sure impress you when you most need it on those emergency situations! If you have a puncture, do not worry, it also comes with an emergency repair kit so you can keep going on your journey! 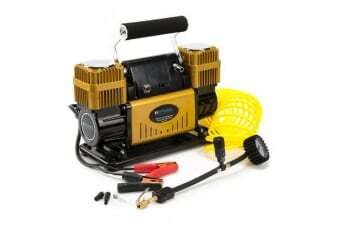 This is a compact yet efficient compressor and this inflates an SUV/4WD tyre in a blink! It can inflate various types of tires so it is also very versatile! The hose is also very unique and it comes with a very easy to use deflation valve which you are able to pre-set to the desired pressure so in case you over inflated or would like to drop the PSI in order to enjoy more grip over sandy or lose surfaces, this function will for sure come handy and practical so you have more time having fun! The compressor main body is made of premium quality heavy duty parts. 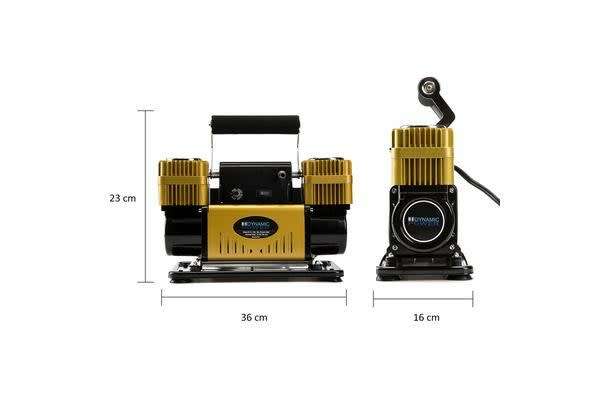 It is equipped with premium stainless steel 50mm valved cylinders, lifetime bearing mounted gearless direct drive copper motor, fused overload protection, dual foam air filters, heavy duty alligator clamps and an extra safe rubber sealed power cable in good length. A bonus carry/storage case comes with the compressor so you can keep all the holes and cables tidy and take the compressor wherever you want in your vehicle! The compressor comes with a bonus tyre repair kit in case of emergency and also a 3 different type of head attachment so you can inflate not only tyres, but also balls, inflatable boats, balloons, etc! The compressor comes with 12 months warranty so you have an extra piece of mind that what you are buying it a quality product! Come and grab one of this amazing, versatile, handy and efficient compressor and make your next off-road trip unexpected incident free!